Index annuity sales are on the rise. According to LIMRA, 2013 sales increased by $5.4 billion, representing a 17% hike in volume, more than any other form of annuity. This product is perfect for the risk adverse client. There was a time when financially conservative clients had to settle for either: 1) the guarantee of principle and a minimum interest rate; or 2) market volatility with the potential of higher returns, but also downside risk to principle. They don’t have to settle anymore. Offer them a potentially higher interest rate environment with 0% risk to principle if held to maturity. One of the most powerful features of index annuities is “locked in gains.” Index annuities use annual point-to-point strategies that secure whatever gain was earned. Not only is principal protected, but the gain is protected as well. 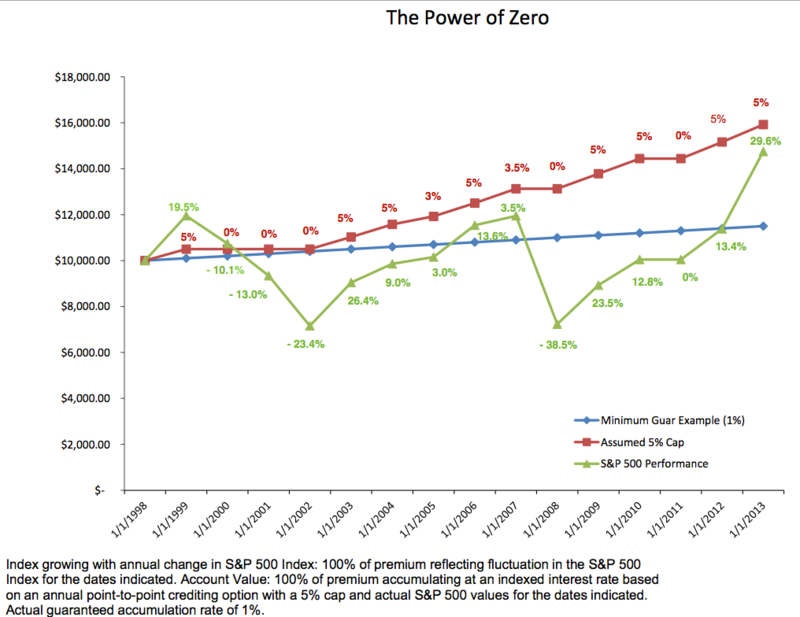 The chart on the left compares S&P performance over the past 12 years against the point-to-point index annuity with a 5% cap. It is easy to see the value of locking in gains and avoiding market downturns. Protecting against a loss is always more financially powerful than achieving a gain. Guarantee of Principal — Unlike most securities and mutual funds products where account balances are subject to the volatility of the markets, fixed index annuities have the best feature of a traditional annuity — a guarantee of principle. Your client participates in market-indexed interest without market-type loss. Higher Returns — Product uniqueness originates from the potential of stock market-linked interest credits without the potential of any market-type loss. In contrast to a securities-type product or mutual fund where the investor bears the market risk, the fixed index annuity concept insulates the contract owner from any risk of loss of principal due to market downturns. Most fixed indexed annuity products usually allow the owner to participate in two or more investment strategies. Remember that there is no stock market return. Instead the interest rate return is linked to an index like the S&P 500. Dynamic Ways to Build —Right now, the fixed index industry is offering more compelling methods to accumulate and provide retirement income. Traditional index annuities have been linked to the S&P500. Today, there are index options like Gold, NASDAQ, and more. Recently, carriers have developed volatility managed index options that provide 100% participation without class. Contact us to learn about new fixed index annuity products and features. Power of Tax Deferral — Money can grow faster because interest is earned on dollars that would otherwise be paid as taxes. The principal earns interest and the interest compounds allowing greater accumulation of money over a shorter period of time, thereby earning a greater return. Liquidity — Contracts generally allow for some type of penalty-free withdrawal for up to 10% of the full accumulation value. Guaranteed Lifetime Income — With a Living Benefit Rider, a fixed index annuity can offer a guaranteed income stream. Your client can chose from several payment options, i.e. annual, quarterly or monthly. If the owner dies, the assets avoid probate: With death, assets go straight to the beneficiaries on the contract. Because the money doesn’t become part of an estate, it avoids probate, where creditors can lay claim to it. Remind clients that they should not expect fixed index annuities to mirror the exact performance of any stock market indices. Contacting a tax advisor or accountant for specific advice is also prudent. The fixed index annuity is a powerful financial tool designed to meet long-term retirement needs. By helping people plan to live the life they want, you’re also building your own future. Ask us about specific fixed index annuity products. We can share commission options and provide product training. Call 844.CFG.PLAN (844.234.7526) to build with us and protect client assets.